Information on alternatives to pesticides is a key issue to the problematic of pesticides prohibition by national or European authorities. In the neonicotinoids debate, pesticides industry and industrial farmers claim no alternatives exist to neonicotinoids. The reality is different. 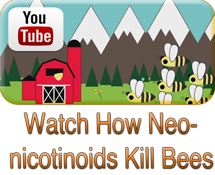 Many alternatives to neonicotinoids exist but their spreading among the agricultural world is limited. PAN Europe is thus willing to make them public and diffuse the information to decision-makers and farmers. In order to increase knowledge on alternatives to neonicotinoids, PAN Europe, the European Beekeeping Coordination, the European Greens and Slow Food have organized a conference in March 2013 in the European Parliament on Pollinator friendly farming and alternatives to neonicotinoids. Our NGO is currently working on a comprehensive report on alternatives to all neonicotinoids for many crops. In order to contribute to the current debate on the feasibility of farming without neonicotinoids, PAN Europe has published a non-comprehensive list of Chemical and non-chemical alternatives to neonicotinoids.